NP Event Space, located in an 1800s Northern Pacific Railroad property, features both industrial and finished elements. Palmer Bar at Breezy Point is one way to relax after a day of golf. Madden Inn & Golf Club features an open, scenic lobby area located in the heart of Madden's. Grand View Lodge features multiple event spaces and is a premier culinary destination. View of the lake or golf course are featured in each accommodation at Madden's on Gull Lake. Take a moment to consider how lucky Minnesotans are to have ways to embrace every season, from ice fishing and snowmobiling to boating and hiking. 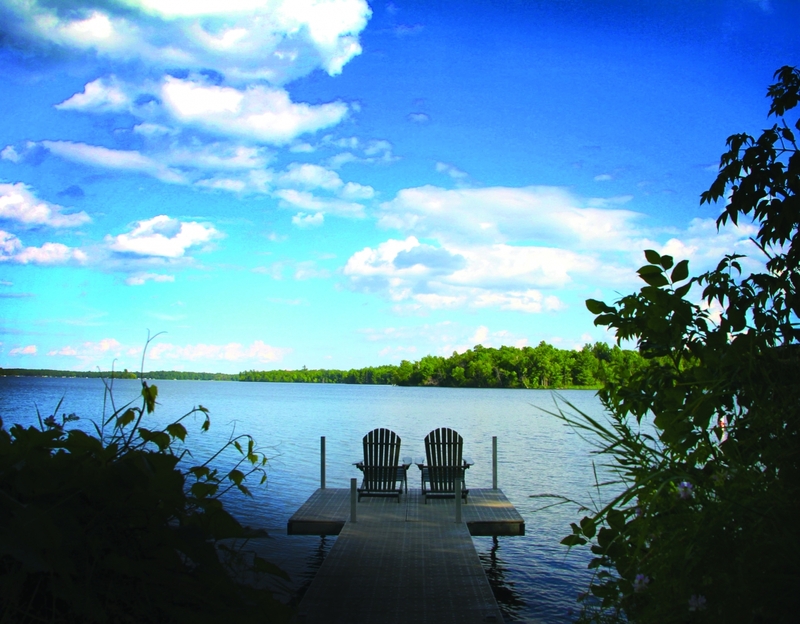 Give your attendees the opportunity to connect with each other and nature by meeting in the Brainerd Lakes Area, with dozens of resorts, hundreds of lakes, and thousands of acres of wide-open green space. Insiders recommended fall and spring as the most bang-for-your-buck times to book, but with so many outdoor and indoor activities, the Brainerd Lakes Area is truly a yearround destination. As Frank “Chip” Soukup III, marketing director for Grand View Lodge says: “There’s so much to do, visitors only get bored if they want to.” Presented here are just a few of the options available up north. Grand View Lodge in Nisswa is the mostawarded resort in the Brainerd Lakes Area (and Minnesota) for good reason: “We are a four-star resort with five-star service,” says Soukup. “What sets our facility apart are the premier multibedroom accommodations that enhance team-building. They truly set us apart from other resorts and venues. They facilitate team-building and networking—with two to seven private bedrooms and baths but a common space. Groups have been extremely pleased with these accommodations.” Multiple event spaces include the Gull Lake Center and newly renovated Norway Center for up to 400 guests. Don’t miss the on-site restaurants: “Our restaurant offerings are something we’re really proud of,” says Soukup. “We’ve become a premier culinary destination; we use locally sourced ingredients and our chefs can compete with the best in Minneapolis.” The resort has excellent amenities any season, but the ideal time to book, if possible, is between mid- October and April. “This gives the best chance for large groups to be together for a team experience,” says Joe Lindholm, sales manager. “There is a greater range of accommodations and we can cater and pamper guests a lot more during that time,” adds Soukup. One of the most exciting new venues in the area is NP Event Space. Located in an 1800s-vintage Northern Pacific Railroad property, co-owner Aimee Jobe has created a fresh space with both raw and finished elements. “The NP Event Space is an amazing, unique property in a historic building,” says Polipnick. “It’s got high vault ceilings, modern amenities— they’re constantly improving the space.” Jobe, a photographer, has created an aesthetically impressive venue: Spaces include the Blacksmith Shop, where guests enter through massive doors to an 8,000-square-foot indoor space with capacity for up to 535 and updated electrical, heating and air conditioning, industrial lighting, original brick walls, chandeliers and new restrooms. Other indoor options offer more intimate space. Several outdoor options on the 47-acre property will fit any warmweather event, with no maximum capacity and parking, but limited electricity. In 2016, an additional 25,000 square feet of fully furnished space will be included. The same family has operated Ruttger’s Bay Lake Lodge in nearby Deerwood for five generations—even the nine-hole golf course, designed by Haas “Zig” Ziegler, is nearly 100 years old. “What makes Ruttger’s unique is our history,” says owner Chris Ruttger. “Being family owned and our outstanding customer service. We treat each guest as if they are an extension of our family. Our resort has all the amenities and luxuries of a large corporate hotel with the comfort and feel of a family-owned northern Minnesota resort.” Meeting space, conveniently located in the main lodge, can accommodate groups up to 300 people, but intimate space is also available. Lakeside cottages, large villas and conventional rooms attach to the main building. “Pelican Lake is probably our No. 1 draw [at Breezy Point Resort],” says Tweed, “and golf is the No. 2 reason people come here.” Indeed, the Deacon’s Lodge golf course was named the “No. 2 Best Arnold Palmer Designed Course in the World You Can Play” by Links magazine and was also included in Golf Digest’s “100 Greatest Public Courses.” “We have three big ballrooms all connected, so you could have your general session in one, meals in another, and social hour in another— great for large groups,” says Tweed. Tweed adds that one distinctive offering at Breezy Point is entertainment and team-building. “Our entertainment is second to none,” giving examples of paintball on the resort’s private island and music on the lakeshore. Groups can also combine networking, dining and team-building with a private excursion on the 100-person Breezy Belle paddleboat. No overview of Brainerd would be complete without the prominent Madden’s on Gull Lake. “Madden’s offers 42,000 square feet of meeting space—the largest accommodating up to 650 people,” says Marketing Director Kathy Reichenbach. In addition, 1,000 acres of manicured green space is available for breaks. The entire property can be reserved (based on availability), and all accommodations overlook the lake or golf course. Custom team-building and activities take full advantage of the property; try lawn bowling, bocce ball, horseshoes and more in Madden Olympics, or a unique Iron Chef event. Reichenbach emphasizes that Madden’s inclusivity mean that “after the meetings are over, attendees typically stay on property rather than scatter off to other restaurants or venues— the ‘meetings’ continue long after the day’s business is complete.” Madden’s closes for the winter to spend millions on yearly upgrades, but holiday parties and dining are still available December through March. Although most groups tend to stay at the resorts post meeting, the Brainerd Lakes Area offers a variety of ways attendees can make the most out of their trip. Test your adventurous side by sliding more than 1,000 feet down the largest tubing hill in the state at Mount Ski Gull. Guests can also snowboard and downhill ski, with rental equipment available. Afterward, warm up in the chalet with food and beverages. With a full-service bar and grill, events such as the Twin Cities Auto Show and races from January through October, the Brainerd International Raceway can entertain guests after events. Three indoor waterparks ensure the swimming and splashing don’t have to end when cooler weather hits. The Paul Bunyan Water Park at Arrowwood Lodge, Three Bear Water Park at the Holiday Inn Express, and Comfort Suites Rapid River Lodge each offer multiple family-friendly ways to work out cabin fever.